To celebrate Spring in MapleStory, the developers launches 5 new events in the Maple World. Players Lv. 33 and above can begin by clicking the rocket-shaped event notifier on the left-side of the screen, or by speaking to NPC Captain Ovo in town. 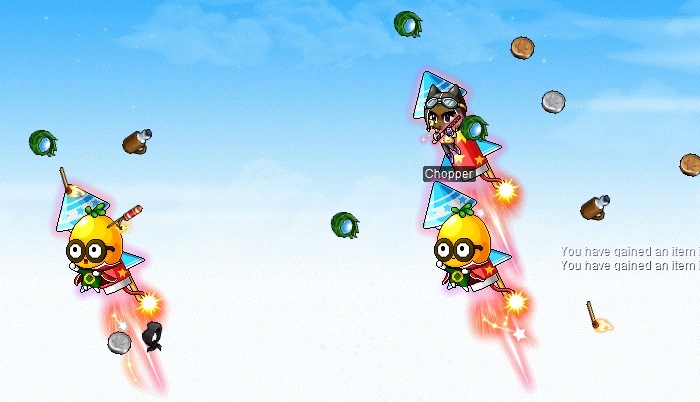 • Players can collect more <Rocket Booster> Ember and <Rocket Booster> Gunpowder by hunting the Dangerous Rocket monsters appearing in major towns. • Practice flying on a rocket in the Rocket Rider mini-game. Fly around the map avoiding obstacles and collecting rewards and Rocket Booster items. Play through three different stages and earn Rocket Booster Points. • Accept the quest ‘[Golden Rocket Rider] Sweet Cookie Basket’ and stay logged in for 15 minutes to receive a Rocket Cookie Basket. Your cookie basket contains delicious Rocket Cookies that grant 2000 Rocket Booster Points. • You can collect 10,000 Rocket Booster Points per day. Accumulate those points to receive rewards. The event starts on Wednesday, April 5 and ends on Tuesday, April 25. Players Lv. 33 and above can get ready for spring by accepting the quest ‘[Spring Heatwave] Blazing Attendance Check' from the event notifier on the left-side of the screen. Hunt monsters within your level range (10 levels below and 20 levels above) to complete the day’s attendance and receive a stamp. Earn rewards including Master Craftsman's Cubes, Meister's Cubes, Selective 8 Slot Coupon, Chaos Scroll of Goodness 50%, Mysterious Meso Pouches, and a Damage Skin Random Box. You can also get a box from completing a random mission. Open the box to receive 20 Maple Reward Points and one random item such as trait items, restorative items, Master Craftsman's and Meister's Cubes, scrolls, and Mysterious Meso Pouches. Hopefully you will find the amazing Sun Chair! 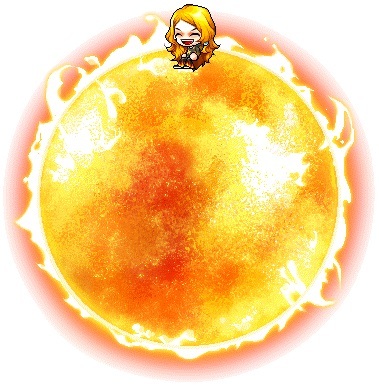 The heatwave also causes solar-powered benefits such as runes appearing more frequently and with decreased cooldowns, bonus 200% EXP from runes, 2x EXP from hunting Inferno Wolf, Sudden Missions appearing more frequently and with a higher limit of 6 per day, and being able to enter Monster Park for free 7 times on Sundays. The event starts on Wednesday, April 5 and ends on Tuesday, April 18. Players Lv. 10 and above can begin by accepting the quest from NPC Gaga, located in the Event Hall. Collect 30 Colored Eggs that drop from monsters within your level range (10 levels below and 20 levels above). Return the eggs to Gaga and you’ll be rewarded with a 14-day Daddy Moon Bunny Totem that gives STR/DEX/INT/LUK +20, and Weapon ATT/Magic ATT + 1. You’ll also get 1-day bunny-themed equips. Dress up in the Moon Bunny costume and wield your Lord of the Carrots weapon! This quest can be repeated once a day, so that you can keep looking cute all season. The Mad Bunny is looking for Easter Eggs! Players Lv. 10 and above can speak to him in the Event Hall to begin the event. Hunt Eggy Popp monsters and collect the Golden Eggs that they carry. Each Golden Egg is worth random amounts of EXP, depending on your level range. Keep an eye out for more Golden Eggs, as you can exchange an egg every 2 hours! Hunt monsters within your level range (10 levels below and 20 levels above) to collect 10 Easter Eggs. Easter Eggs come in three different varieties depending on your level range. If you're Lv. 70 and above and collect Red Easter Eggs, in addition to the charm and restorative items, you will also receive Mad Bunny’s Easter Egg! Crack it open to receive one random item such as a Shiny Easter Egg buff, Moon Bunny Word Bubble and Label Rings (30-day duration), Anniversary Prime Scrolls, Spell Traces, Mysterious Meso Pouches, and more. It also contains a 14-day Lady Moon Bunny Totem that gives STR/DEX/INT/LUK +20, and Weapon ATT/Magic ATT + 1. Players Lv. 10 and above can accept the quest by speaking to NPC Cassandra in the Event Hall. Hold onto the Gold Colored Egg and a Paint Brush for 30 minutes, and you’ll receive a Shiny Easter Egg buff that grants you 2x item drops for 30 minutes. You will also get a Golden Easter Egg which contains one random item, such as trait items and a 14-day Mommy Moon Bunny Totem that gives STR/DEX/INT/LUK +20, and Weapon ATT/Magic ATT + 1! Equip all three Moon Bunny Totems at once to see the complete effect and receive an additional Weapon ATT/Magic ATT + 18!